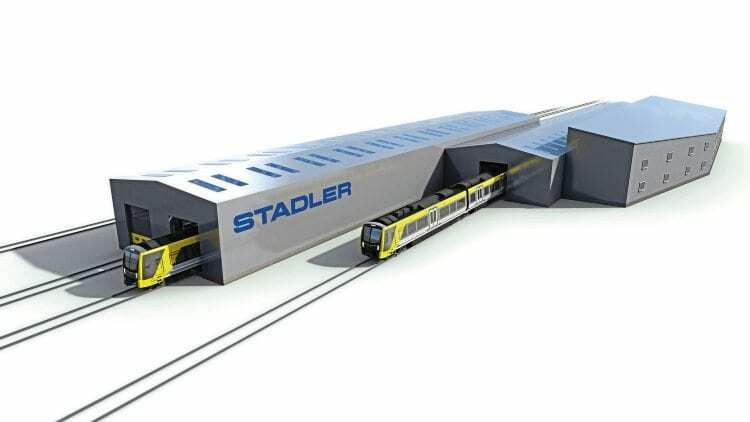 STADLER has confirmed it will build a £20million depot at Kirkdale to maintain its fleet of new trains for Merseyrail. Civil engineering company BAM Nuttall has been contracted to construct the state-of-the-art depot and refurbish the facility at Birkenhead North. An artist’s impression of the new Merseyrail depot that Stadler are planning to build at Kirkdale. The deal is part of the £700million contract signed last month for Stadler to manufacture and maintain a fleet of 52 new EMUs for Merseyrail. The Kirkdale facility will include washing and stabling facilities, a maintenance shed with run-through tracks, office space, and a simulator suite. The design includes potential for the depot to be extended for 80-metre long trainsets. Birkenhead North will be upgraded with a new washing facility. Once the new Kirkdale depot is ready it will focus on overnight servicing and cleaning. Construction work is due to be completed in 2019, in time for the arrival of new vehicles for testing.